One of "the bosses of criminal world" of Uzbekistan Salim Abduvaliyev trades official positions and hosts Uzbek ministers and their wives at the receptions where they generously treat the relatives of Abduvaliyev. This was reported in the diplomatic notes of former US Ambassador to Uzbekistan Jon Purnell, published by Wikileaks on January 13. In one of the cablegrams (governmental telegrams, transferred through own channels – editorial note) Jon Purnell wrote "Salim works with the Deputy Minister of Internal Affairs [Tursunkhan Khudaybergenov] responsible for personnel issues to arrange government jobs, agreeing on a price and then adding his own fee before selling the position". 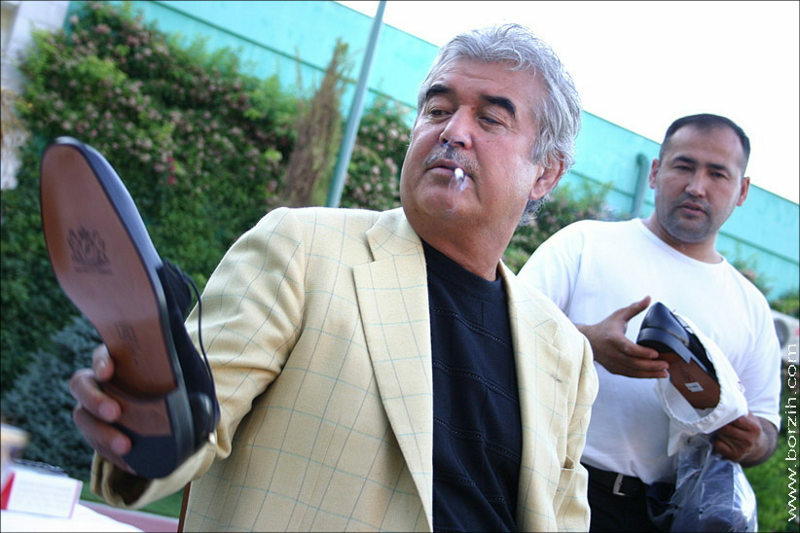 The document names the Tashkent businessman, godfather and sports sponsor Salim Abduvaliev as "the boss of criminal world" of Uzbekistan and "mafia boss". "Salim has reportedly sold a wide range of Government positions, including regional Hokim, police chief, and Ministry of Internal Affairs jobs. A man named "Abror hoja" brings job applicants to Salim, who discusses the price of the purchase and facilitates the transaction. The contact said that Salim closely cooperated in the past on such job purchase transactions with State Adviser to the President Ismail Jurabekov, and former Minister of Interior Zokir Almatov". All the apparel, shoes and furniture of Salim Abduvaliyev are produced by best western designers individually and each item has his own emblem. Photo is copied from the blog of Moscow-based photographer Victor Borzyh that was hosted by Salim in January of 2009. "In one example of Salim's sway over GOU [government of Uzbekistan] personnel decisions, a regional mayor appealed to him for help retaining his job after he came under pressure to resign. The wife of Maksim Teshebaev, the mayor of Tashkent's region's Orta Chirchik district, approached Salim's wife asking for Salim's support. For the right price, Salim promised that Teshebaev would be able to retain his job. According to the contact, Salim instructed Teshebaev to make a payment to his brother, Azamjon Abduvaliyev, in order to retain the job. But after the payment was made, Salim reportedly mocked the amount of money Teshebaev offered, saying he "couldn't eat a meal" for that amount" Mr. Purnell wrote. "According to the contact, Salim locates foreign and other investors interested in GOU tenders, putting them in touch with an Iranian businessman holding British citizenship. The Iranian prepares the paperwork, submitting the tender to First Daughter Gulnora Karimova for approval. (According to the contact, former Deputy PM Dilbar Gulomova's son works for this Iranian) Tenders arranged through this process reportedly include the Dutch Gemka (ph) firm's railway investment in Bukhara, which required paying Salim a $700,000 fee, a Swiss/Israeli company's water project in the Tashkent region, and a Korean company's large-scale contract to provide computers to schools", said the cablegram, published by Wikileaks. Therefore, according to former US Ambassador "Corruption is rampant in the GOU. Tenders and government positions can be fairly easily secured by paying the right amount of money to the appropriate individual". According to another cablegram of Mr. Purnell, "Video footage obtained by Post suggests close ties between families of senior GOU officials and organized crime. The engagement party for Salim’s son, Sardor, was held in July 2005 at Salim’s mansion in Gazelkent near Tashkent. Following tradition, only women attended the engagement party. The close-knit group of around twenty guests included the wives of Interior Minister Matlybov, Justice Minister Mustafayev, Finance Minister Azimov, and Foreign Minister Ganiev, as well as Deputy Prime Minister Kasimov's sister. Salim’s daughters also attended, along with the wives of leading businessmen Muhiddin Jamol (the owner of Alp Jamol-Bank Muhiddin Asomiddinov – editorial note), "UzbekSavdo" chairman Zafar Faiyziev, and "UzbekComuneHizmet" General Director Halmukhamedov. According to our contact, Salim did not attend the party, but provided each guest with a necklace worth $1,000. The video shows Jamol handing out $100 bills to the guests as they dance. (It is common in Uzbek culture for money to be given to women as they dance, and also to musicians.) Video footage of the party also shows Salim’s fleet of black Mercedes-Benz cars. According to former US Ambassador’s contact "Salim's Gazelkent home was decorated by a Versace representative flown in for the job. Photos of Salim’s house reportedly appeared last year in the Russian magazine "Vysshee Obshchestvo" ("High Society"). According to our contact, Salim has now built another "palace," which will be his preferred dacha, while the Gazelkent estate will reportedly be used by his wife, lovers, and daughters". The cablegram indicates that “The birthday party for Salim’s wife, Shahlo, took place at a Tashkent restaurant in summer 2005. In addition to Salim,’ daughter and son, guests at the birthday included former Foreign Minister Mahmudova and the wives of Foreign Minister Ganiev and Deputy Prime Minister Sultanov. The wives of "UzbekComuneHizmet" General Director Halmukhamedov and foreign-based oligarch Fatokh Shodiyev also attended, along with famous singer Yulduz Usmanova. According to the contact, most guests gave Shahlo $3,000 in cash, while Shodiyev's wife gave $10,000. (Shodiyev reportedly left Uzbekistan in 1994 after making a fortune in the cotton business, and is now living in Kazakhstan and Belgium. He holds a senior position in the Eurasian Industrial Association and is rumored to be an adviser to President Nazarbayev)". Ferghana international news agency continues to monitor WikiLeaks publications.